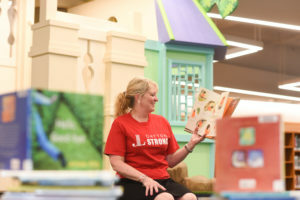 The Junior League of Dayton initiated its current community impact focus area of literacy during the 2014-15 League year, launching its effort by working with local elementary schools to restock their libraries and assisting local branch libraries with their literacy programs targeting school-aged children. The most extensive piece of the League’s literacy focused community impact offerings is Learn, Grow, Explore; a fun, educational literacy-based activity series held at the Dayton Metro Library’s Northwest Branch during the summer. Spurred by the need to counteract summer slide, the Junior League of Dayton teamed up with the Northwest Branch to plan and host six well-attended lunchtime programs during June and July. The 1-hour programs take place after the library serves free meals to area children through the federal summer lunch program, giving the League a built-in audience of children eager to learn and participate in fun-filled activities. Themes for the Monday sessions range from theater to science, and librarians select age-appropriate books to incorporate into the activity. In addition to the Northwest Branch partnership, the Learn, Grow, Explore team is working to add more community impact shifts throughout the year to promote literacy efforts in greater Dayton and get more League members involved. Ideas include partnering with other community partners serving children and families, assisting branch libraries for literacy events throughout the fall, winter and spring and taking part in community events on National Read Across America Day March 2 (Dr. Seuss’ birthday!) and the Month of the Young Child in April. For more information about Learn, Grow, Explore, please contact the Junior League of Dayton at community@jldayton.org.